Background: The skull has a complex shape and can have potentially a wide range of shape deformities. One of the most common is that of plagiocephaly….or a twisted skull. This is most manifest in the back of the head with one side flatter than the other. This may or may not be associated with bulging or overgrowth of the fuller or non-flat side. While correctable in infancy through the use of molding helmets, many affected patients miss this window of opportunity for numerous reasons…one of which is the belief that the patient will outgrow the deformity. Case Study: This Asian male presented with a significant right occipital plagioephaly. 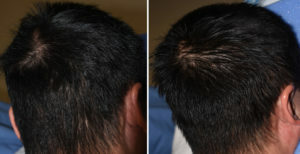 Using his 3D CT scan a custom implant was designed to build out the flatter side of the back of his head as well as blend into the fuller side. This designed implant showed a central projection of 15mms. Thus a first stage scalp tissue expander was placed and filled to 90ccs. Six weeks later, the custom occipital skull implant was placed using the previous scalp incision. 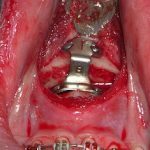 It was only made 1 cm longer to allow the implant to pass through in a folded fashion. To enable the implant to be folded fairly tightly, three 90 degree internal wedges were placed on the inside of the implant but not completely through it. This internal relief of material enables a smaller fold of the implant than would otherwise be possible. Once inside the pocket the implant was unfolded and positioned according to the design. Double screw fixation as then placed at the bottom of the implant as seen through the incision. A flat back of the head can be completely corrected using a custom implant augmentation. 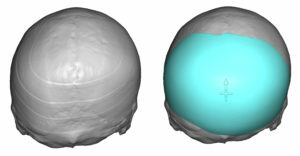 To get a complete correction in some patients, the scar must be adequately stretched to accommodate the ideal size of the designed skull implant. 1) Flatness on one side of the back of the head (plagiocephaly) is one of the most common skull shape deformities. 2) Plagiocephaly correction by a custom skull implant must take into consideration the potential stretch of the scalp tissues. 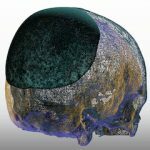 3) Static scalp expansion is usually sufficient for many larger custom skull implant placements.